Each of our therapeutic products are handmade in small batches using only the finest ingredients to create a healing product that will nourish your body and spirit. You will never find toxic chemicals, fillers, sulfates, parabens, synthetic fragrance or color in our products. We use the healing benefits of hydrating honey, enzyme rich royal jelly, bee pollen and propolis, plant derived essential oils, fruit essences, medicinal herbs and soothing botanicals with clays and minerals mined from the earth. We create therapeutic beauty products inspired by pure ingredients from nature. We blend our passion for natural purity with this philosophy: if you are putting it on your skin, it should be safe enough to eat. Below is a list of the ingredients we use and a brief description of the healing properties of each. Pamper your body with our royal treatments – you will love the indulgence. We use unpasteurized fresh organic goats milk, milked daily at our own Three Goats Farm. Goats milk is wonderful for treating sensitive, dry skin or conditions such as eczema and psoriasis. Goats milk contains Alpha Hydroxy acids which helps remove dead skin cells from the surface of your skin. Alpha-hydroxy acids are well known for softening skin and leaving it smoother and younger looking. It is a moisture rich superfood for your skin. Our honey comes from our Apiary at Three Goats Farm, in Montgomery, Texas. Honey is very soothing and hydrating. It offers an enzyme and nutrient rich nourishment for the skin. It is naturally antibacterial, so it’s great for acne treatment and prevention. Honey is full of antioxidants which can slow down the signs of aging. Honey is a natural clarifying agent, as it opens up pores making skin brighter and clearer. Honey isn’t the only things bees make. Bees also produce a compound called propolis that is used as a coating to build their hives. Used for thousands of years to treat wounds and fight infection, propolis is a natural disinfectant and has antibacterial properties. Bee pollen is rich in vitamins A,C,D and E and contains 22 amino acids, 27 mineral salts, hormones, carbohydrates and more than 5,000 enzymes. It is used in cosmetics as an antibiotic, anti-itch and anti-inflammatory agent. It can also be helpful in treating acne and for those with sensitive skin. Royal jelly is a thick, pastelike substance produced by worker honey bees. It contains water, proteins, sugar, fats, vitamins, salts and amino acids. Its chemical composition allows queen bees to become fertile, grow considerably larger and live longer than worker bees. The chemical composition of royal jelly is beneficial in treating skin disorders and improving overall skin health. Coconut oil has long been praised for its anti-aging properties. It is rich in proteins. These proteins keep hair and skin healthy and rejuvenated. External use of coconut oil can speed up wound healing, increase hydration and reduce water loss in seriously dry skin. Coconut oil smells delicious, nourishes skin and leaves it smooth to the touch. Olive oil is closer in chemical structure to the skin’s natural oil than any other naturally occurring oil. It is the perfect moisturizer for skin and hair. Olive oil has regenerative properties over skin tissue and regular usage ensures that skin is soft and smooth while keeping it toned and firmed. All soap making is dependent on a chemical reaction using lye and oils. When mixed, lye and oils create a reaction called saponification and the end result is soap plus glycerin. In commercially made soaps, the glycerin is often removed and the end result is a product that is drying to skin. When making our soaps we use just enough lye to create the proper chemical reaction. After curing for several weeks, no lye remains in the finished product. Used in soap making for hundreds of years, tallow is rendered animal fat and is what gives soap its creamy lather. It also makes a soap that is very moisturizing and gentle for your skin. Coffee is full of antioxidants. Coffee grounds are a natural exfoliant and work well in scrubs and soaps. Coffee is as good for your hair as it is for your skin as it helps strengthen hair follicles and stimulate growth. The caffeine ingredient in coffee will helps to stimulate blood circulation as well as hair growth. Lavender, rose petals, chamomile, comfrey, hibiscus and rosemary are just a few of the dried herbs and flowers we use in our products. Most are grown at our farm in Montgomery, Texas. They add aromatic and healing qualities to our special wellness products . The medicinal properties of the flowers and herbs can also be beneficial when their oils are extracted or infused as essential oils. Hydrates the skin and offers soothing and cooling properties to irritated or inflamed skin. Boosts oxygenation and healing to the surface of your skin and balances PH by alkalizing the surface, while offering numerous nutrients into the cells of your skin. Accelerates healing and collagen production. Our aloe is grown locally at our farm in Montgomery, Texas and is a star of our Luxe Shave Bar and GLOW Hydration Facial Mist. We use a variety of natural clays in our products, such as Bentonite, Rhassoul, Rose Kaolin and French Green. These are added for their ability to draw oils and impurities from the skin, tighten pores and offer soothing moisture without drying. These clays are mined from the earth and contain no chemical additives or colors. Activated Charcoal offers many benefits to heal problematic skin. The charcoal is very porous and will absorb toxins, chemicals, heavy metals and dirt trapped in the pores of your skin. We only use therapeutic grade oils that are carefully steam distilled, while protecting the constituents of these fragile oils. These oils such as Lavendar, Frankincense, Helichrysum, Sandalwood, Clary Sage, Peppermint, Rose Otto, Neroli, Grapefruit, Wild Orange, Rosemary, Melaleuca, Melissa and many others are chosen for their medicinal and therapeutic qualities they can offer to each wellness products. Cocoa butter is a deeply moisturizing and antioxidant rich oil, derived from the Cacao (Chocolate) Bean. It offers improvement in skin texture and elasticity. Reduces wrinkles, scarring and discoloration of aging skin. It is a foundation of all of our wellness balms. Also known as Morrocan oil. It is rich in Vitamin E and essential fatty acids. Heals and protects the skin and hair. It offers UV protection from sun damage. It is a favorite ingredient in our serums and therapy oils. Most similar to our natural scalp sebum . It is shown to reduce dandruff, prevent hair loss, control frizz, remove build up on hair follicles. We chose to include this magical oil in our shampoo bar and our hair therapy. This oil is the star of our Healing Facial Serum. It offers an abundance of Vitamin C and Lycopene which gently rejuvenate skin and help maintain strong elasticity. It has a beautiful fragrance and amber hue that shows its nutrient and antioxidant properties. Castor oil from the Castor bean plant , improves blood circulation to the skin and scalp. Helps re grow thinning hair and adds luster and sheen to dry/damaged hair cuticles. Prevents breakage and split ends. It is a key element in our Hair Therapy oil. Shea butter (Butyrosperum Parkii) is rich in essential fatty acids, vitamin E, phytosterols, vitamin D, pro-vitamin A and allantoin. This organic essential combination creates a superfood for your skin (and hair). It offers properties that heal minor cuts, abrasions and burns- it’s a beneficial ingredient in our Honey Hydration Balm and our Lip Therapy.It can offer relief to muscle aches and pains and is shown to stimulate collagen production, which can make the skin stronger –looking more youthful and supple. Helps protect and repair dry, rough or chapped skin by locking in natural moisture. It also inhibits the growth of bacteria and fungus, which can prevent skin conditions such as dermatitis, eczema, acne and psoriasis. It offers a strong anti-inflammatory benefit for reduction of swelling and irritation. Shown to reduce scarring and stretch marks due to its high Vitamin A content. 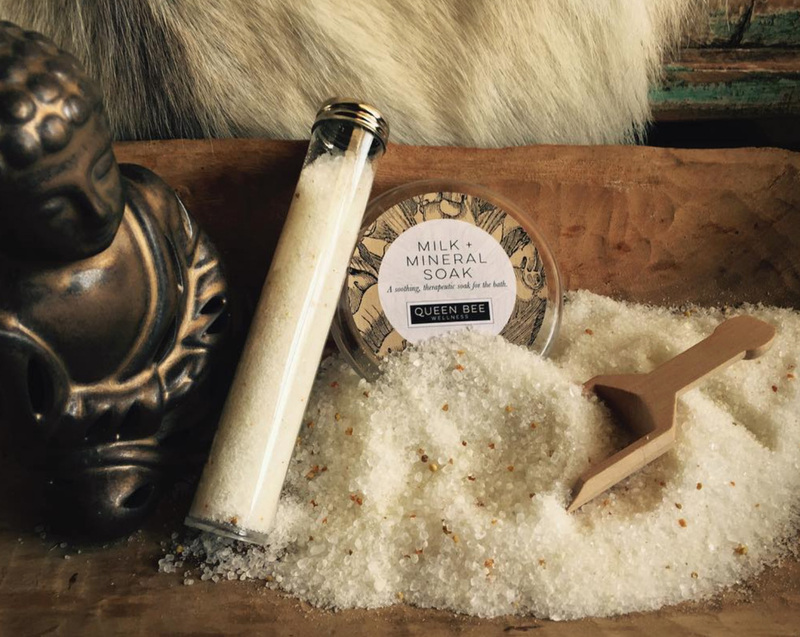 Our luxuriously lush body scrubs contain a base of organic sugars. The sugars help exfoliate dead skin cells by a gentle scrub and the glycolic acid (naturally occurring in sugar) helps loosen these cells for a smooth and glowing skin. © Copyright 2015-2017, Queen Bee Wellness. ​All rights reserved. Design by Bluehaus Design Co.